Rashida Tlaib ran as an anti-Jewish bigot, and she means to use the power of her Congressional seat to push for anti-Jewish policy(s). Tlaib is the representative for Michigan’s 13th Congressional district. She’s not Secretary of State. Her job is to serve the people of Detroit, a failed, near-bankrupt city. Should Tlaib be using taxpayer funds to fund Nazi-inspired trips to the Jewish state to urge the boycott of Jewish businesses? Is that what the people of Detroit elected her to do? Democrat Palestinian-American rep-elect Rashida Tlaib (D-Mich.) is planning a trip for lawmakers to visit the West Bank to counter the Israel trips offered to new members of Congress by the American Israel Public Affairs Committee (AIPAC). 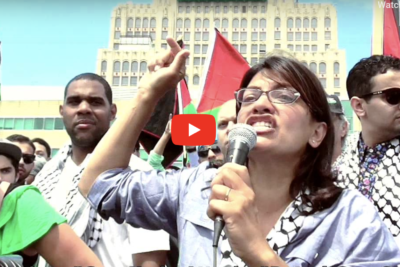 Tlaib has also stated that she supports the Boycott, Divest, and Sanctions (BDS) protest movement against Israel. Tlaib is hoping to bring a delegation to Beit Ur al-Foqa, the West Bank village where her grandmother lives. The soon-to-be Congresswoman also told the Intercept about her support for the extremely controversial BDS Movement. The Nazi boycott of Jewish businesses was the direct antecedent to the boycott, divest and sanction Israel movement. Tlaib and incoming Rep.-elect Ilhan Omar (D-Minn.) are the first Muslim women to be elected to Congress and both have expressed their support of BDS. The AIPAC trips are traditionally scheduled during the first August recess, and the new lawmakers typically meet with Israeli leaders in government and other sectors. Tlaib told the Intercept that she has no intentions of her delegation to meet with Palestinian leaders. The AIPAC trips will likely be lead by incoming Majority Leader Rep. Steny Hoyer and incoming Minority Leader Rep. Kevin McCarthy. “While it has not yet been planned, Mr. Hoyer intends to once again serve as the senior member on a delegation of Members of Congress to Israel next year,” Annaliese Davis, a spokesperson for Hoyer, told the Intercept.